This Angel in Flight Weather Vane was handmade from copper and brass, with optional gold leaf accents on the face, arms, wings and feet. This is one of our most energetic angels; speeding along with trumpet blaring and hair flowing out behind her. Each wing consists of two separate panels comprised of numerous individual chased lines to create a bold visual aesthetic. They are meant to contrast texturally with the softer billowing folds of her gown. All our human figure type weathervanes are crafted with translucent glass jewels for eyes. We offer a number of different eye colors from which you can choose. When this Angel is between you and the sun, even if she is high up on a rooftop, you can often see light shining through her blue, green, amber or amethyst colored eyes. The effect is truly beautiful. In some of our weathervanes we follow the medieval convention of having the halo appear vertically, circling her entire face. With other angel weathervane designs, we follow the more contemporary convention of placing the halo horizontally over the angel’s head. Because our weather vanes are each handcrafted to order you may select the style of halo you prefer. 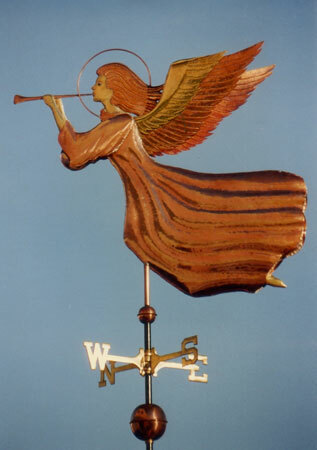 This Angel in Flight Weather Vane is one of several angel designs offered here at West Coast Weather Vanes. These custom copper angels are part of our larger series of representative weathervane designs that also feature dragons, mermaids, gods and goddesses and other creatures and figures from literature.